I know, I know, it's snowing outside and I'm in here going on about Spring Break essentials. But Friday it was 70 degrees and I'm holding out hope that this snow will immediately melt away and yield to sunny 75 degree days. A girl can dream right? And if it happens to melt away, I'm ready with a few of my must-haves. Sakroots sent over this adorable XL tote (vinyl, so it's waterproof and ready to hang poolside!) and printed espadrilles that just so happen to perfectly coordinate with my swimsuit. With a little SPF and lip balm, I'm ready for a little fun in the sun. Now all I need is a destination! 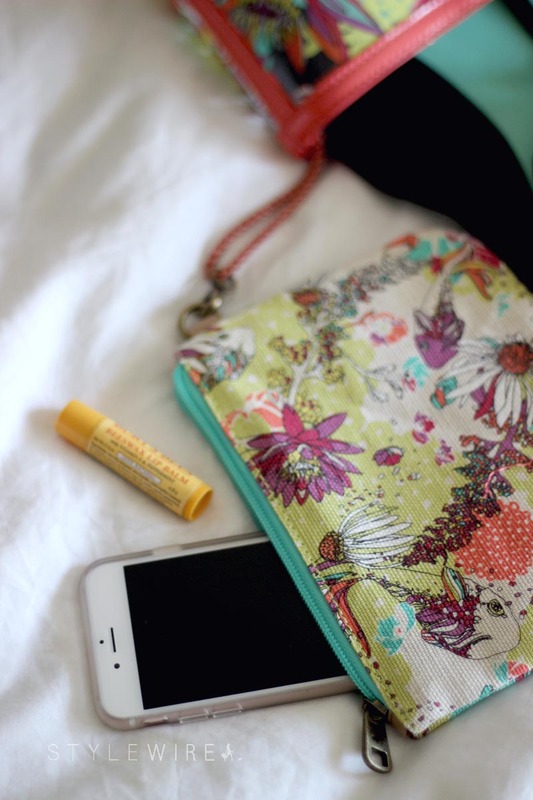 To liven up this snowy Spring day Sakroots and I are giving away a printed cosmetics case! Just head to the Sakroots site and leave a comment with your favorite print on Instagram later today! Each unique Sakroots print benefits a different charity. My Zen Garden tote benefits the San Francisco Botanical Garden Society and my Seafoam Flower Power espadrilles benefit the North American Butterfly association. It's Spring style with a cause at Sakroots! Giveaway runs the evening of Sunday April 3- Monday April 4 at midnight. Winner will be selected Tuesday morning. This post and giveaway was sponsored by Linqia and Sakroots. All opinions expressed are my own. Thanks for supporting those who support Style-Wire.com.